Source: Gallup - Four in 10 Americans Believe in Strict Creationism "... A small minority of Americans hold the "secular evolution" view that humans evolved with no influence from God -- but the number has risen from 9% in 1982 to 16% today. 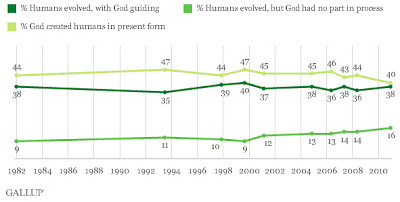 At the same time, the 40% of Americans who hold the "creationist" view that God created humans as is 10,000 years ago is the lowest in Gallup's history of asking this question, and down from a high point of 47% in 1993 and 1999. 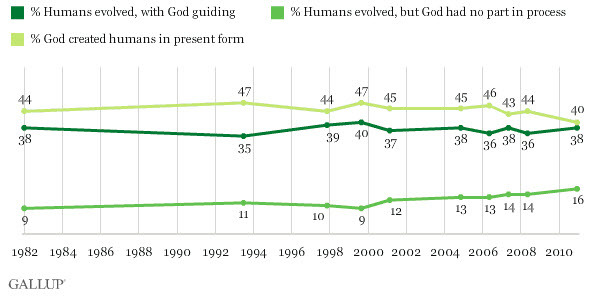 There has been little change over the years in the percentage holding the "theistic evolution" view that humans evolved under God's guidance..."